If you find that the working copy of the QuickBooks data file becomes corrupted or gets destroyed, you need to restore the QuickBooks data file so that you can begin using QuickBooks again. Restoring the QuickBooks data file is easy if you’ve recently backed it up. If you haven’t recently (or ever) backed up the QuickBooks data file, you’ll have to restore the QuickBooks data file, which means starting over from scratch. This means, for example, that you rerun QuickBooks Installation and Setup and re-enter all the old data. In short, restoring without a backup copy of the QuickBooks data file means that you start over at square one. 1Launch QuickBooks, and choose the File→Open or Restore Company command. 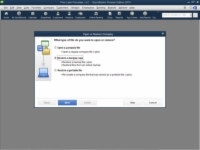 QuickBooks displays the Open or Restore Company dialog box. 2Indicate what type of file you want to restore. 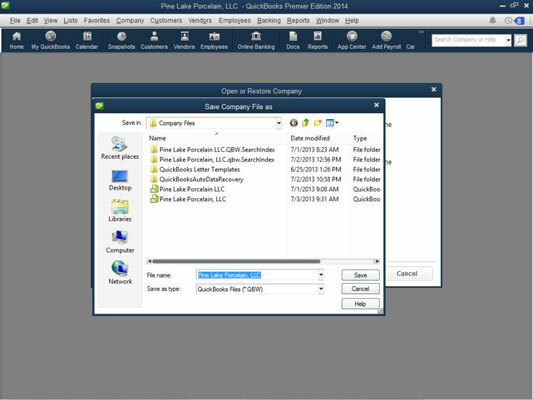 You can use the Open or Restore Company dialog box to open a regular QuickBooks data file, a backup copy of the QuickBooks file, or a portable file. If you want to restore a backup copy, predictably, you click the radio button labeled Restore a Backup Copy. QuickBooks displays another version of the Open or Restore Company dialog box. 4Tell QuickBooks whether the backup copy is stored at your company or at QuickBooks’s offsite data center. To do this, you just click the radio button that labels your backup copy file’s location. 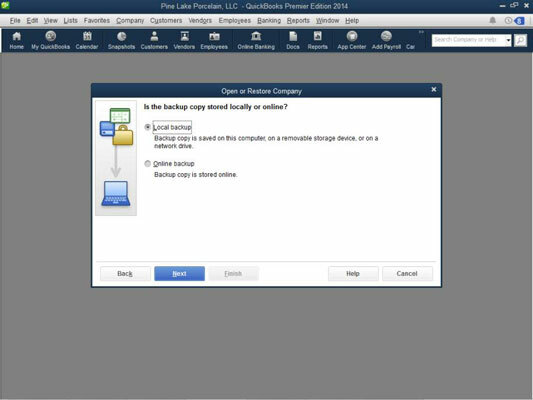 QuickBooks displays the Open Backup Copy dialog box. 6Identify the backup file that you’ll use for the restoration. Use the Open Backup Copy dialog box to specify the location of and then the specific backup file that you’ll use for the restoration. You can use the Look In drop-down list to identify the disk and folder storing the backup file. After you identify the location of the backup file, double-click the file. When you restore the company data file by using the backup copy, you destroy the current working version of the file. In other words, QuickBooks takes the backup copy and copies it over the to-be-restored company data file. Therefore, before you restore company data files, make sure that you’re using the right backup copy and that you’re overwriting the corrupted, to-be-restored company file. If you’re uncomfortable deleting or overwriting the old (possibly corrupted) QuickBooks data file, you can use a new filename for the restored file. You do this as part of Step 9. QuickBooks displays the Save Company File As dialog box. 9Tell QuickBooks where it should restore the backup copy and then click Save. Use the Save Company File As dialog box to pick a location for the backed up file. You’ll probably pick the same location as the existing file. If you do this and also use the same name for the QuickBooks file, QuickBooks displays a message asking you to confirm that you want to overwrite the existing file. You click Yes. After you click Yes, QuickBooks displays another message box titled Delete Entire File. Confirm that you want to delete the existing (and presumably corrupt) company data file by typing the word yes in the message box. Then click OK. QuickBooks uses the backup copy to overwrite the to-be-restored company file. Again, however, note that you can also choose to use a new filename for the restored file. 10Enter any transactions that took place since your last backup. If you entered transactions after you last backed up the QuickBooks company file, you now re-enter those transactions into QuickBooks. For example, if you last backed up QuickBooks on Friday of last week, you need to enter any transactions that you’ve created since last Friday.